It's October 20th, and that means it's time for our monthly big party to celebrate the acting career of Louis Ferreira (Justin Louis)! We have so much to share this month - charity news, a ton of Motive, Breaking Bad and Primeval: New World stuff, photos, sound clips, transcripts, our exclusive Reading Series, interviews and screencaps, and a Q&A. Grab a free pineapple drink of your choice at the bar and come on in - the good times start right now! Ferreira Fest has received a lovely Canadian Thanksgiving card from one of our designated charities, the Children's Aid Foundation of Canada. Please click on the thumbnail below to go to the CAF page to view and read the card. And then please consider making a donation. Winter is almost upon us, and neglected children and homeless seniors need our help more than ever. If you had a good meal today and a roof over your head for tonight, please think of those who aren't as fortunate. Remember, for every donation you make Ferreira Fest will send you a small gift as a thank you. 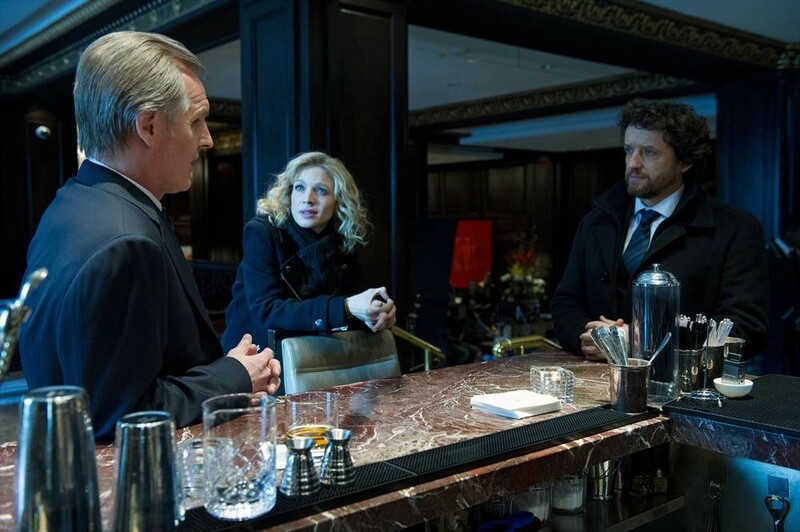 Season 2 of Motive was also picked up in the United Kingdom! Ildi from Hungary writes: MOTIVE has reached Hungary as well! It will air on October 29 at 9:25 PM on Viasat (and probably will be on every Tuesday) , and its Hungarian title will be Az Indíték. Thanks, Ildi! Note: The site also includes all the character mirror shots that were done as promotional photography. Check it out! Sadly, the MOTIVE Web Series is now gone completely - it has even disappeared from all backup sites. The links are still up on the ABC site but they lead nowhere. We can only hope that the web series will be included as an extra feature in a DVD release. Meanwhile, please send a message to ABC Tech Support and ask that they fix the broken links. Perhaps if enough people report the issue, something gets done! Our researcher Agi has found some great links and photo posts. It often pays to check out the YVRShoots web site for filming news from the MOTIVE set. You can also go directly to the posts tagged Louis Ferreira or Motive. From season 1, here is a photo of a scene with Andrew Airlie from episode 12 "Ruthless". From Season 2 here are some photos by Nigel Horsley. Click on the thumbnails to go to the original posts. Thanks for the photos and links, Agi! More Season 2 photos can be found here on YVRShoots. Lauren Holly shared this stunningly beautiful false-color photo of herself and Louis on 10-03-2013. Thanks for this gem, Lauren! Click on the image to go to the original post. Louis continues to enjoy working with the cast and crew of MOTIVE. LF - And again, I have the greatest group of people that I’m working with. I love this crew so much. I love this cast so much. And Kristen (Lehman) and I just are like this beautiful brother/ sister, respectful, I mean, I could not be… I’ve never been happier with a co-star in my life. I just adore that woman! Louis enjoys talking about his experience on Breaking Bad, and specifically his character, Declan. FF – What fascinated you about Declan’s character, and what do you like about him? LF – You know, well, I kind of liked, as I continue to evolve into, like we all do, into ourselves. One of the things that I’ve been pursuing… it’s funny, when I go back and I think of when I used Justin Louis as my name, my whole reason for acting was to escape. And when I switched over to my real name, the idea has been about embracing me. And that I am actually validating my stuff, my own life, my own journey. And there’s something very empowering about that trust in yourself. Because it really is like… you don’t have an excuse to be going “oh, it’s not me”. So there’s a lot more of me going into roles and stuff. And even if I’m playing characters that seemingly don’t seem like me, like I’m certainly not a bad guy! But in the Declan thing, well, I was drawn to the idea – this guy who’s kind of… you’re not quite sure how to read him. You can tell, he’s got, obviously, a past. But there’s something, there was a spiritual aspect to him. And that’s what I took from Declan that I liked, that there was actually a sort of, very sort of rooted, grounded… like a lot of the characters that I’ve been trying to explore it’s implicit, in that, where you’re left wondering what really is his deal. And what I like sometimes, you are ambiguous in the sense that people can fill in their own blanks. There’s just something interesting about that. And that’s what it was. And I got to tell him, “Thank you for letting me be part of one of these great shows that are out there, it’s wonderful to know that there are still shows that have this impact on people." I also pitched to him a show called Breaking Good where I would start off as a crack addict, sociopath, serial killer, crazy, and I end up a spiritualist alone on a mountain top. I pitched it as a joke. He loved it. He thought it was hilarious! Breaking Good! Go the other way around! And one of the comments he made that was really funny was that… he goes, “You know, I have someone that had a letter from someone who’s told me that they started watching the series backwards, and as they watched, they were like, you know what, I’m really beginning to like this guy.” Which I thought was a really funny commentary on his character. So, you know, I think that Declan, it’s always that when you can play a character that has a mystique or mystery, trust that you don’t have to necessarily fill in the blanks. And that’s good writing. And that’s good storytelling. LF – So it was just nice to be, again, it was just nice to be part of a very, very popular show where people have obviously made a huge connection with it. And it’s just like, yay! That’s one of the highlights. You have these moments and you’re working and you’re trying to survive, and then once in a while, you get… you score a home run. And that’s how that one felt for me. Hope that made sense. LF – Yeah, it’s like you get rattled, and then it’s like in that last scene he was a version of himself, which is quite right. And then… I think there were possible plans to have explored that character more, but again, I was so privileged and felt so happy to be a part of something that - I mean, every day I get stopped by like, “You were in Breaking Bad!” More than anything. I’m just like, wow! When a show is popular, you just, it’s just, something that I personally… I’ve always worked but never had that real… that’s not happened to me a lot in my life, career-wise, so it’s kind of been interesting to go… and I just sit there and go, wow, that really was… people loved that show! You can see the impact Breaking Bad had on Louis' Wikipedia Page - whenever an episode of the series aired his page hits increased dramatically! Declan's meth lab ("It's not filthy - it's just dimly lit.") was located in an old school bus buried underground in the Arizona desert. In episode 510 "Buried" we see both the outside and the inside of the lab. FF – Was that inside of a sound stage? How did they do that? LF – Yeah. Yeah, that was inside of a sound stage and they took that bus… actually, the first time I saw it, it reminded me of a, there’s a cartoon show… The Magic School Bus. FF – Oh, yeah, yeah, yeah! It’s very much a magic school bus! LF – And I was like… (sings) There’s The Magic School Bus! Except it’s meth! The magic… you know it was kind of funny. I was just like… it was a really cool set. LF – Yeah, it was just neat, but yeah, it was inside of a studio. FF – So you literally had to climb on top of the set to get into it. LF – Right, well, you know, the outside stuff we shot outside. They had put a fake hole there that was for - once you go down it was like five feet you just crouched in. LF – And they built the downstairs set separately and shot that separately, so, it was neat. Here is a lovely photo of Louis chatting away with Bryan Cranston during the filming of episode 507 "Say My Name". For a very large version click on the thumbnail below. Morse Bicknell played Declan's Driver in all three of Louis' episodes in Breaking Bad. He was kind enough to participate in a Q&A with fans online at Reddit. You can read the entire interview here. Below is an excerpt in which Morse mentions Louis. The people. Really the nicest cast and crew I've yet worked with. I had a great time hanging out with Louis Ferreira who plays Declan. He's a very gregarious and funny guy, the sort who was friends with everyone on set after about 10 minutes. Several people - including Louis himself! - pointed out the brilliant Heisenberg/ Declan cartoon made by BreakingBadComicMaker.com. Click on the thumbnail to see the original post. Our researcher Agi found this great photo of Declan's last moments. In this rare image the blood from Declan's wounds is clearly visible. Click on the thumbnail to go to the original photo. The above photo led to a question about doing death scenes in general. Here are Louis' thoughts. FF – You’ve done a good number of death scenes over the course of your career, so this is specifically about Buried again. What are the challenges of filming a death scene? Do you prepare yourself mentally? And is there occasionally a grieving process for the character that you go through? LF – That’s an interesting question. No, I don’t think you prepare, I mean I don’t, I think for - it’s just your job as an actor is to fulfill the part. If you’re gonna die, you’re gonna die. I can’t connect with that. Because that’s - personally, I don’t carry it with me. LF – There’s a death, there’s a… that’s where I have my little mourning process, is in that area, not the actual scene, specifically the death, that would be just part of my gig. So I don’t think there’s anything specific to it. Just another day at work, you know? Q: The death scene of Everett Young on Novus (Stargate Universe, episode 218 "Epilogue") was quite different, in that it was a duplicate version of the character that died at a ripe old age. How was Young's passing in that episode different from, say, Declan's demise? LF – I like that, I enjoy, that’s just one of those lovely things where you’re like, yeah, I mean, I had a moment of going, if I can make it to this age, I will be an old man one day on my death bed. LF – But the ability to be comfortable with it? And I was just like… so we had a good day of going "when I’m old, I’m going to be still, I’ll still be a whippersnapper!" People will love you. It’s - we had fun with it. But yeah, that was definitely a different vibe for me just simply because there was that part of me where I was, wow, this is an old man dying in his bed. And it’s funny, I just ran into the handsome young man, his name is Shaughnessy (Redden), who played my son, down on Granville Island. He’s like, "I played your son!" You know, he was forty years old. I’m like, ah - it’s so weird, ‘cause I have a twenty year old son, and in twenty years he will be forty, and I will be older and possibly on a, who knows where, and it’s just, uh, it’s funny. We connect dots, right? So, the other great thing about acting, you get to… anytime I feel like I’m out of “me” sometimes, I still enjoy the aspect of things that are different. LF – Like every time you get thrown a curve ball amidst what it is you’ve used to been doing now, because it becomes like second nature. So once in a while you get that day where things are, something different happens, it becomes an exciting day. Sadly, the show Primeval: New World was cancelled after only one season. But we still ended up with some major Louis-footage, especially in episode 111 "The Inquisition", which is essentially a long interrogation that Louis' character Colonel Henderson Hall conducts with various characters of the main cast. FF – How do you approach a scene where there isn’t much dramatic action, such as the interrogation? Basically, it was ten minutes of talking heads, but how do you deal with a scene like that where you can’t really do a lot of active stuff, where it’s really just a conversation? LF – Well, that’s a great question and it’s something I enjoy, because it really falls on the actor then to create moments that aren’t necessarily on the page. I feel that with Motive. It’s very hard… our show Motive is very procedural. We just speak exposition. How do you lift exposition off a page? It’s very frustrating at times, and it’s very challenging. But that’s been the whole - our whole journey on Motive has been that particular ride. In that particular case there was a lot more context in it. And one of the things is, I was doing Breaking Bad, I got offered Primeval, finished the Friday, started driving. I was gonna work Primeval Monday. So I’m doing a road trip with my dogs. Alone. And it’s Saturday night, because normally I can memorize pretty quickly. I was like, "oh, I’ll just -, I can memorize the day before", and Saturday night I decided to read the script for Primeval because I hadn’t really. And Saturday night, I’m in a hotel, and I look at the script, and I’m like, twenty pages, what?! Because you never shoot twenty pages in a day! You shoot seven, eight pages, if that, usually. And I’m like, twenty pages of dialogue! Not only that, I’m talking the entire time! (laughs) And I was like, "what, I wonder what’s going on, what am I doing?" And so, I kind of had a little bit of a panic attack. And then I slowly started to do the work. And when I showed up, I still was far from really feeling like I owned it. FF – Yeah, I did not realize you shot that all in one entire day. Wow! FF – That’s crazy! I mean, it’s a long dialogue to begin with but to do it just all in one day, wow! LF – That was one day! LF – It was nice. It was good, because that was when I was like, okay, I’ll shave the beard off, and I’ll have a mustache. LF – And I will grow the beard back if Motive comes back. FF – That was the mustache role there! Later on Louis mentioned that PNW star Niall Matter had just done a guest spot on MOTIVE. You can also read about it at YVRSHOOTS: Wednesday, September 25th - Motive films Kristin Lehman, Louis Ferreira & guest star Niall Matter at a marina near Granville Island. Thanks to Agi who found this gem of candid shots as well! And to celebrate the record-breaking 20 pages of dialogue shoot here are well over a thousand screencaps from the episode "The Inquisition". Below are photos posted on Twitter either by Louis himself or his buddy David DeLuise who visited him in Vancouver in the end of September. Thanks for sharing those great fun moments, David! Here is a web page that has some nice high resolution photos of Louis in various roles and agency shots, collected from around the web. A quick follow-up to the interview David Blue did with Julie McNiven where it was mentioned that Louis had played the role of the dentist Orin Scrivello in the musical "Little Shop of Horrors". FF – Apparently, you played the Dentist in Little Shop of Horrors. Do you remember that? LF – Yeah, yes. But that’s neither here nor there. It was a very small amateur production, not on my level, but yes, that, I loved that play and always wanted to do it again, professionally. I’ve always loved that musical, it’s something that I enjoy. I love musical theater, so yes. Here is a video clip of Steve Martin playing Orin Scrivello in the musical film version. This is his big solo "I am your dentist". What do you think? Can you see Louis doing this part? And from the "Blast from the Past" vault came a question from a Ferreira Fest visitor. FF – Were you ever a camp counselor at Camp Robin Hood? LF – Yes, I was in fact a camp counselor at Camp Robin Hood and loved it. Yes! Great job. I absolutely loved being a camp counselor. I was there for several years. Absolutely! Got a question for Louis? Want to know something about an aspect of a role he's played or about his craft in general? Send an email. His answer will be included in an upcoming issue of Ferreira Fest. It might take a while but we'll get to it eventually. Not sure if your question is appropriate? Drop us a line. This month Louis reads chapter 8 of one of his favorite books, "Are you as happy as your dog?" by Alan Cohen. Please join me in thanking Mr. Cohen for graciously allowing us to do this reading series and sharing it with everyone. Please be sure to visit his website at alancohen.com. Click on the thumbnail of the book cover to purchase a copy of the book. When Munchie is tired, he sleeps; when he is rested, he gets up. He eats when he is hungry, and walks away from his bowl when his tummy is full. When someone pets him, he stays right where he is and groans with delight. When he is in pain he stops what he is doing. When he finds a sunny spot on the grass he lies down and naps. When the weather is bad he stays in the house. He moves his body a lot, and he feels good. And here is a slightly longer version which includes some personal comments from Louis. He moves his body a lot, and he feels fantastic. LF - I'm gonna say "fantastic" 'cause it says "good", but I think "fantastic" is our word. FF - It's perfect. Yep. All screencaps are from the screencaps collection here at The Friends of Louis Ferreira. Mike – Glad to see you could make it out. Declan – Well, I was surprised to get your call. Mike – Good surprised, I hope. Here’s one gallon as discussed. You take that back home to your people, test it, if you’re satisfied I can get the other six hundred and sixty five. Declan – All right, that’s fair enough. Mike – Shall we talk money? Mike – That one’s free. The price for the rest is fifteen thousand per. Six hundred and sixty five gallons, that’s nine million nine hundred and seventy-five thousand. Although I would prefer you round it up to ten. Makes it easier for my partner and I to split. Mike – Mmhm, we good? Declan – Yeah, I’ll talk to my guys but I should be able to put together that cash, yeah. Declan – I gotta tell you, this is worth it just to get that blue stuff of yours off the market. Declan – The blue stuff will be off the market, right? Declan – You know, this whole time I was thinking, six sixty six, that seems like an odd number. Two thirds of an even thousand, though. When I look at it that way it starts to make sense to me. That’s not all the methylamine, is it? You two have a partner you haven’t mentioned? Mike – This other party wouldn’t be a problem for you. His territory won’t impact yours. Declan – You see, that doesn’t work for me. I’m not just buying this for the supply, I’m buying this for the demand. I’m looking to increase my market share here, Mike. Mike – Well, I don’t know what to tell you. Declan – I want you to tell me that Fring’s Blue will be off the streets. Declan (nods) – All right. Here’s a new deal for you, then. I’ll pay you fifteen k a gallon for the full thousand gallons. Not a drop less. Mike – It’s not mine to sell, Declan. Declan – (shrugs) Well then, no deal, Mike. And that's about it for this month! All these goodies should keep you busy for quite a while. Please remember that all content of Ferreira Fest is under copyright protection; the copyright lies with the original owner of the material when so mentioned, everything else is the intellectual property of The Friends of Louis Ferreira. Please do not repost or use anything without permission of the copyright owner. Thanks to Casey for all the transcripts in this issue, and many thanks to all the people who have contacted us with links, photos and news - we couldn't do it without your help! A quick note about autograph requests: at this time we cannot accommodate autograph requests. Autographed photos are expensive to produce and ship and we do not have a budget for those expenses here. We can also not charge for them because then we have to register as a business and pay taxes. Please understand that that's just not possible. Autographs are always available for purchase on eBay. If you have any comments please feel free to sign our Guestbook, visit our free Forum for all sorts of Louis-related discussions, or contact one of our staff members. We're always delighted to hear from you! We hope to see you again next month, and if this is your first visit please feel free to surf the site to your heart's content.